Children need space for unrestricted movement and to think freely. Ajanta Public School, Basant Avenue, Amritsar play school understands this vital need of growing child and caters to its developmental processes accordingly. School has a separate 'Pre-School Block', where we allow children to enjoy their magical years. The Tiny-Tots grow unhampered, their curious minds engaged in various activities, through fun activities they increase their general awareness and vocabulary. 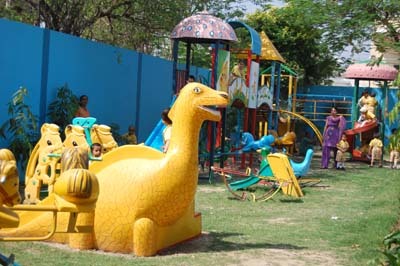 Fiber glass play ground equipment-colorful play Station is a wonderful gift of the school for the kids. Pre-School Tiny-Tots run freely around and squeal in excitement, their enthusiasm is doubled when they enter the garden and enjoy the different rides. For Pre-School kids health, nutrition & recreation are essential. Knowing well the curriculum of Tiny-Tots is just games, music, dance inculcating good eating habits, cleanliness & speech development.